If you’re in this boat, you’re not alone. Social media algorithms are complex and ever-changing. But learning the basics, as well as a few key strategies, can help you better navigate and understand the world of social media marketing. So, what are social media algorithms? And what do we need to know about them in order to get the most out of our social media efforts? To put it simply, an algorithm is how social media platforms filter, rank and organize the content we see based on a specific set of criteria. The algorithms behind each social media platform are complicated, to say the least. So rather than diving into the minutiae of each algorithm, we’re going to give you a high-level overview of each one and focus on the steps you can take to improve your social media ROI. In this post, we’ll look at Instagram, Facebook, Twitter and LinkedIn, and what makes each of their algorithms unique. Then we’ll equip you with our recommended tactics for effectively decoding these algorithms so you can improve the chances of your posts being seen. Interest: Instagram predicts how interested you (the user) will be in an individual post based on your search history and past engagement in the app. Recency: When you log in, you’re most likely to see posts that have been published within the last few hours before seeing older posts. Relationship: The more you engage with an account (liking, commenting on posts, being tagged in photos, etc.) the more you will see posts from that account. Following: If you follow a large number of accounts, you'll see fewer posts from each individual account. Usage: If your Instagram visits are typically short and sweet, you’ll see the most relevant posts first. Frequency: When you log in, Instagram tends to display the top posts that have been shared since your last session in the app, regardless of how long it's been since you logged in. Content that is receiving lots of comments, likes, replies and shares. Links that are being shared between friends over Messenger. Content that is being shared by credible users (credibility is based on historical behavior and profile completeness). Live video, which typically generates more interactions than other forms of content. Recency: The more recent the post, the more likely you are to see it. User credibility: Accounts with strong credibility have a greater chance of getting their followers to see their posts. Native content: Posts that are created specifically for Twitter and don't link to external websites are promoted more highly. Engagement: The more you engage with a particular account, the more likely you are to see their future posts. Time spent on a specific user profile: Spending more time viewing someone’s page or Tweets tells Twitter that you want to see more from that account. Relevant content: LinkedIn's algorithm aims to connect users with content that relates to keywords used in their profile. To get more eyes on your content, makes sure it's relevant to your network. Posts that are widely shared: Reaching your 2nd and 3rd degree network can make your post more prominent. Posts with high engagement: Posts that generate lots of likes, comments and shares within an hour after posting are ranked highest. Content from credible sources: Links shared from credible, trustworthy websites will get more views than links from sketchy or unverified sources. Create content that encourages interaction: Ask a question, for example. Tag relevant people: If you share an article, tag the author and/or publication. If you're sharing a piece of content that you know a certain user will like, tag them. If you share a case study, tag the customer or client. Remember not to tag users who don't have anything to do with the post. It may seem innocent, but this sneaky shortcut to garner more views is obnoxious and a bad practice. 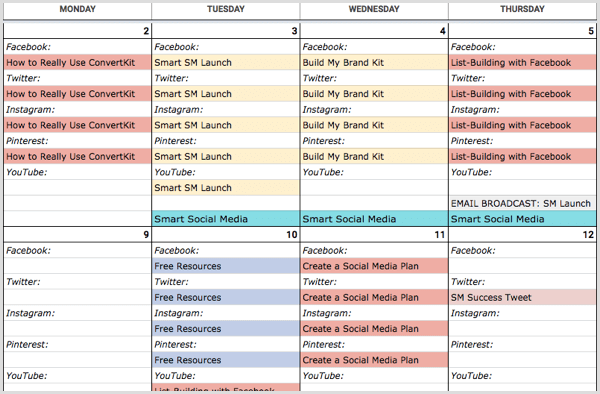 Get to know your buyer personas and share targeted content: Use a social media calendar to plan content for each of your audiences. The more your content relates to a specific group, the more likely they are to engage. Double-check that your profile is credible: Every section of your profile should be completely filled out with up-to-date information. Build a relevant network: When your network is relevant to your industry, your content has a better chance of appearing in feeds and being shared by your followers or connections. Use live video (when appropriate): Live video is a great way to provide helpful content while humanizing your brand. The video below is from the 2018 Vans US Open Facebook page showcasing the Women's Jr. event. Take an 80/20 approach to content: Roughly 80% of your content should be native/owned. Utilize analytics: Analytics will tell you what kinds of content are performing well with your audience so you can replicate successful posts and identify optimal posting times. Engage, engage, engage: Remember, higher engagement = stronger presence in feeds. There’s no one-size-fits-all solution for “beating the algorithm,” but the tips above will help your posts climb higher, reach the right people and enjoy a longer lifespan. If you found this article helpful, be sure to subscribe to our monthly email newsletter at the bottom of the page for more tips and resources!